Back in 1955, two men had a conversation at the famous Clam Box restaurant in Cos Cob where they both worked. “What do you say we go into business and open our own place?” asked Fred Orrico, a kitchen steward. “Sure, why not!” replied Joseph Chelednik, a chef. The two scouted the region, finally coming upon an empty old house and real estate office on Route 7, a little north of Route 35. The spot was along a busy highway, and right between Danbury and Ridgefield. 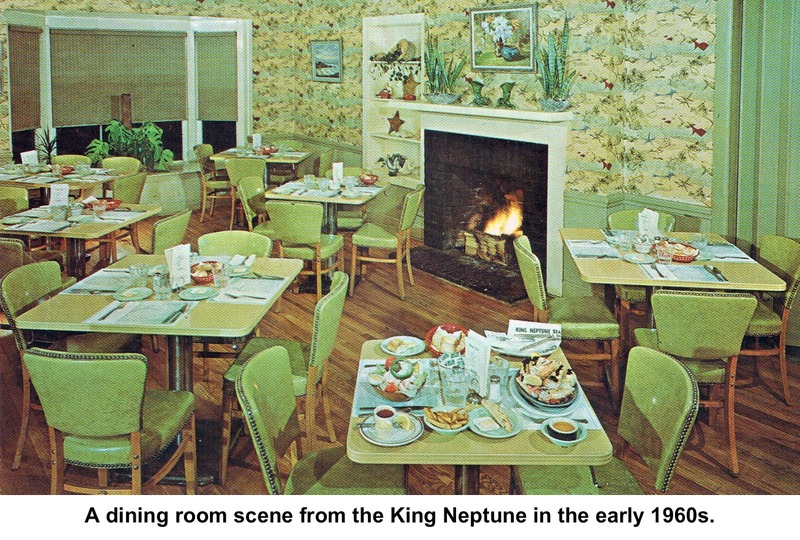 They rented the place, knocked out some walls, and on June 28, 1955, opened the King Neptune, which was to become the most popular restaurant in the history of the town. But the beginning was not easy. That October, Connecticut was hit by the worst flood in more than 100 years. Pavement and bridges along Route 7 were washed away, and the new King Neptune suddenly became a difficult-to-reach destination. The roads and bridges were fixed, the two soon bought the building, and the crowds began coming — many customers from New York City and some from as far away as Philadelphia. 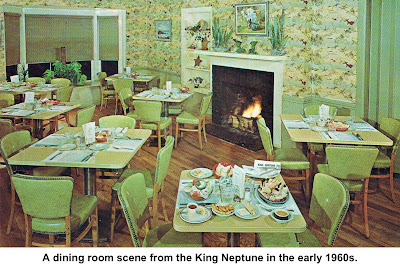 The King Neptune started out seating 80 people. By 1980, 10 additions had been made to the building, which could then handle 320. On Fridays, Saturdays and Sundays, hungry patrons often formed queues that ran around the outside of the building, as they awaited the loudspeaker announcements for their party to be seated. King Neptune was always known for not only good food but modest prices. Back in 1955, that dinner of fish ’n’ chips cost 90 cents. As many as 65 people worked there when the restaurant was at its largest, including 35 servers. Over the years countless teenagers — mostly Ridgefield High School students — got their first jobs at the King Neptune. 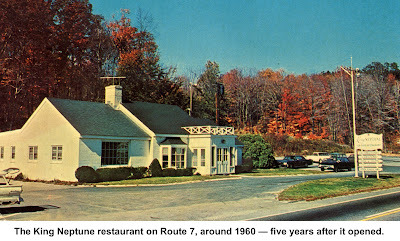 The restaurant was particularly popular with the staff of the Ridgefield Savings Bank, later Ridgefield Bank and now Fairfield County Bank. Perhaps it’s no surprise that Orrico became a director of the bank, a post he held for 18 years. Born in 1923 in Greenwich, Fred G. Orrico grew up in Greenwich and joined in the U.S. Navy during World War II. He was serving on U.S.S. Missouri when the Japanese signed their surrender aboard the battleship. His wife, Helen Casey Orrico served in the U.S. Marine Corps during the war. retirement in 1985, after which sons George and Fred Jr. took over the operation. Chelednik had moved on to other pursuits some years earlier. For many years Orrico suffered from myasthenia gravis, a disease from which he eventually died. “For years, while in its earliest stages, the affliction that took his life affected his eyelids and he had to play with those lids taped open,” Baker recalled. 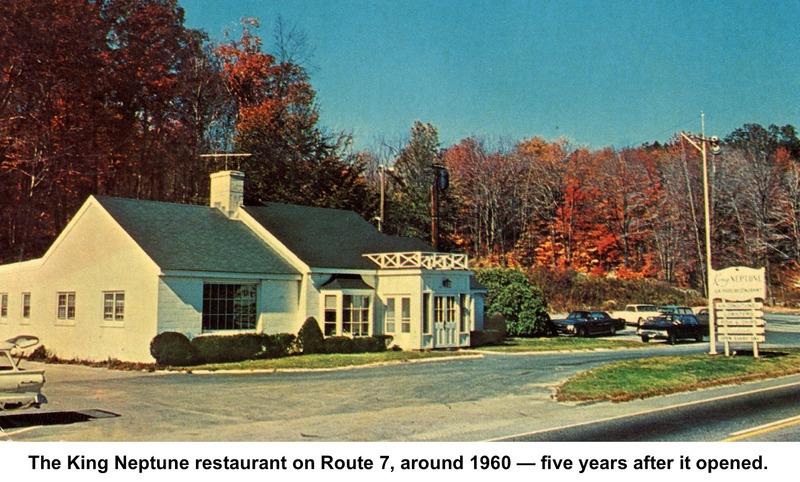 In 1986, the original King Neptune property was sold to Pamby Motors for its new showroom, and the restaurant moved to a Route 7 building just south of the Route 35 intersection. There it remained until December 2005, when it was replaced by The Catch, another seafood restaurant (operated by RHS graduate Arthur Michaelsen, who now has Bartolo on Danbury Road). Son Fred Jr. is now with Gallo Ristorante at Grove and Prospect Streets, and son George is retired. 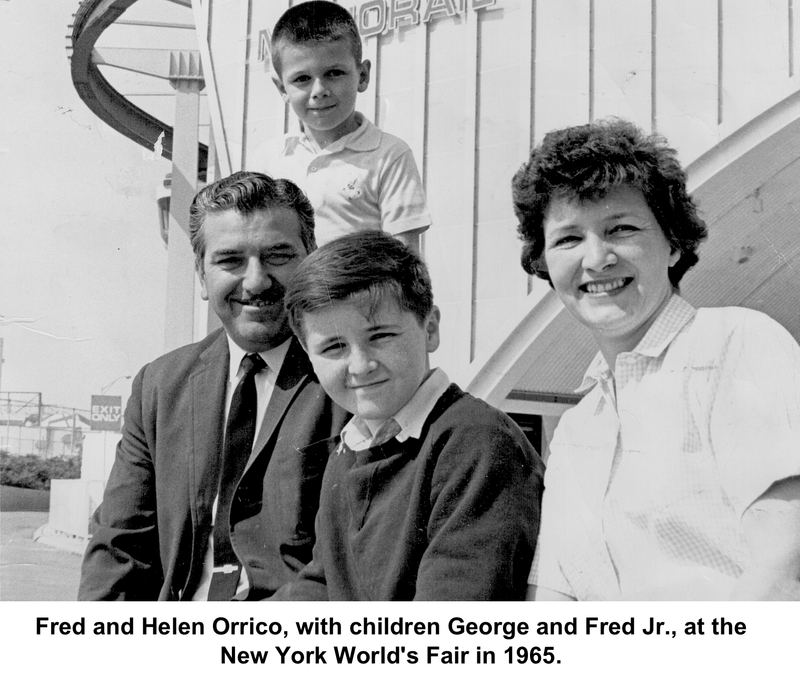 His son, John Orrico, who was killed in the Vietnam War, is also profiled in Who Was Who. Fred Orrico died in 2006 at the age of 82.